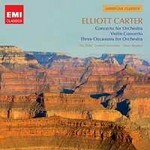 Born 11 December 1908, Elliott Carter will celebrate his centenary later this year. Carter is still an active composer and has recently written a piece for the Boston Symphony Orchestra that is to be performed when he reaches 100.It was as a teenager that Carter developed an interest in music, an interest that was encouraged by a friendship with Charles Ives. Like many other American composers at the time, Carter's early neoclassical style was inspired by study in Paris with Nadia Boulanger, and both Stravinsky and Hindemith became early influences. By the 1950s Carter had developed his mature style and he adopted a more rhythmically complex technique that he called 'temporal modulation'. Needless to say this music is not what might be termed 'easy on the ear', but it is wonderfully crafted, challenging to the listener and never less that rewarding.